Approximately 2,500 tons of obsolete tools and equipment used in service and repair of commercial nuclear power generation facilities required disposal. Neumeyer Environmental segregated, sized, and packaged materials for off-site treatment and processing. We dismantled contaminated components and equipment, and segregated waste materials (metals, wood, plastics, etc.). Neumeyer Environmental shredded the materials to reduce shipping and disposal costs. Valuable warehouse space was cleared of obsolete equipment. Removal of contaminated items from the warehouse reduced background radiation within the building. New roadway construction required crossing an abandoned landfill that had operated for fifty years, unpermitted and unregulated, in a former strip mine pit. 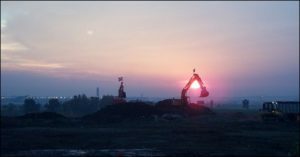 The landfill contained both municipal and industrial wastes. The industrial waste contained heavy metals and chemical solvents. Neumeyer Environmental excavated 300,000 cubic yards of soil and segregated it by contaminant concentration. We recycled the uncontaminated soil as roadbase material to be used on-site. 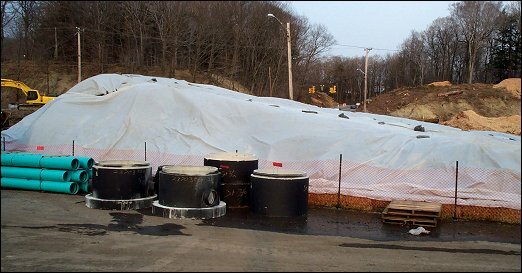 We placed the minimally contaminated soil in an on-site containment cell that PA Department of Environmental Protection (PADEP) permitted specifically for the project. 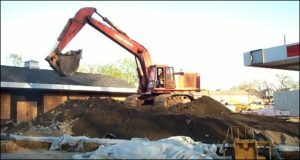 Neumeyer Environmental profiled the remaining soil as either residual or hazardous waste and transported it to appropriate disposal facilities. By segregating the soils, we were able to retain on-site and reuse 270,000 of the 300,000 cubic yards originally excavated, saving millions of dollars in transportation and disposal costs. Excavators Removing Contaminated Soil as Air Force One Flies Over the Site. 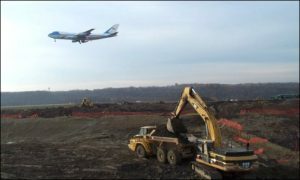 Crews Working at Sundown with Greater Pittsburgh Airport in the Distance. The Urban Redevelopment Authority has been redeveloping the previous Jones and Laughlin Steel Corporation facility for numerous years. This ACT 2 site has been redeveloped as the Pittsburgh Technology Center under a multi-phased program. 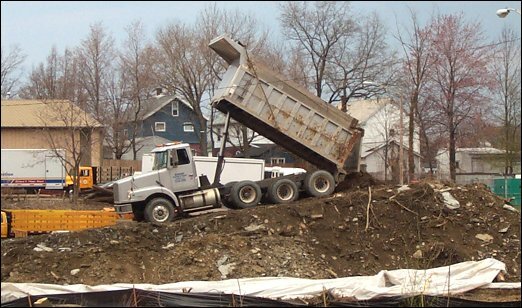 The 2009 phase included excavation of surplus soils that exhibited contamination and required regulated management. In support of the work, Neumeyer Environmental provided oversight, sampling and analysis, application for the Form U permit, and transportation and disposal of regulated residual materials. We provided support to the contractor so that much of the work could be performed by their crews. The load-out operations were conducted during night shifts to allow suitable progression of the work. 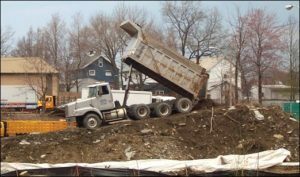 Neumeyer Environmental was able to quickly transport and dispose of the contaminated materials by utilizing truck fleets to transport the stockpiled materials efficiently during non-work hours. This approach allowed the contractor to minimize the stockpile management impacts and on-site spacial constraints.